Welcome to June-time in our garden. As the roses fade we have some other wonderful flowers blooming. The stream orchid (Epipactis gigantea) is a California native orchid. 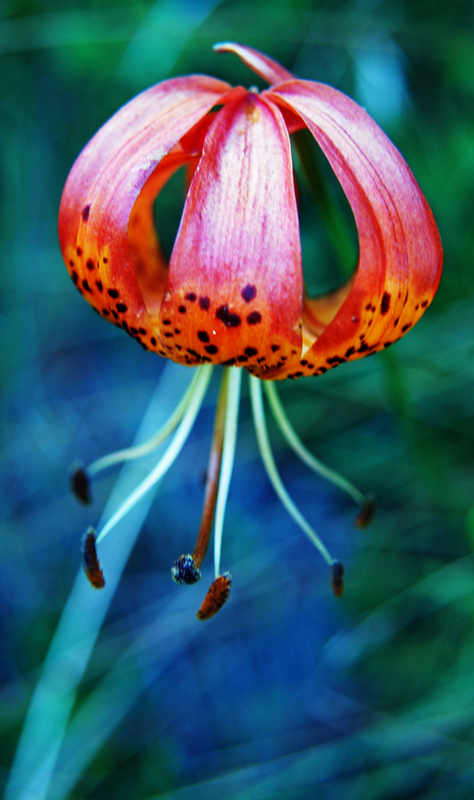 Here’s a closeup; the flowers are only about a half inch. 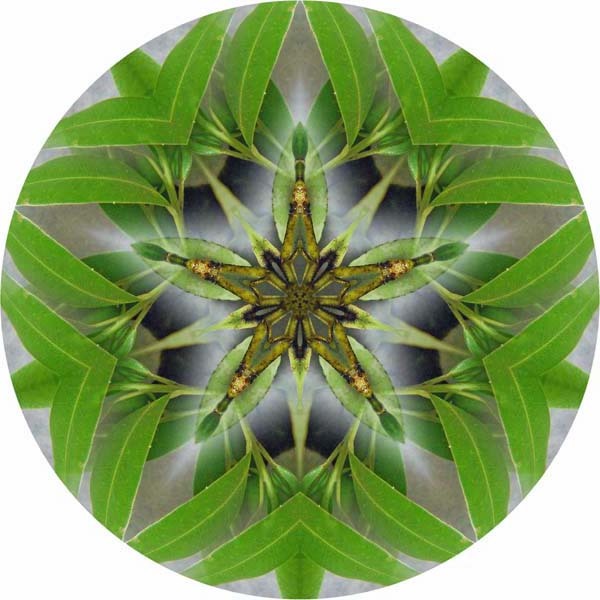 The flowers of the Soap Plant (Chlorogalum) are also extremely small. Bumble bees love these; I’m always amazed to watch the fat bees light on and weigh down the delicate flowers. A trill from our guard-hen, Maureen, alerted us to a visit by Bambi. He was waiting in our neighbor’s yard for us to leave so he could graze on George’s delicious flowers and plants. Last week he ate nearly every leaf off our poor peach tree. Guess the fruit wasn’t ripe enough for him, he left us those. Anise swallowtail butterflies, probably the ones that we raised and released in the past few months, have returned to lay eggs on our fennel. We caught this one flitting about, and I managed to get a photo of her leaving some eggs. Finally, the hummingbirds are back, and happily visiting our flowers and feeders. What’s growing in (and who’s visiting) your garden this summer? Over the last few weeks more than ten of the anise swallowtail butterfly chrysalises that we’ve been sheltering in our butterfly nursery have emerged. These three beauties emerged in one day. We waited for the weather to improve, and took them out to the deck to release them. You can also see two batches of chrysalises still waiting to emerge. For some reason, possibly protection, they sometimes make their chrysalises right next to or on top of one another. 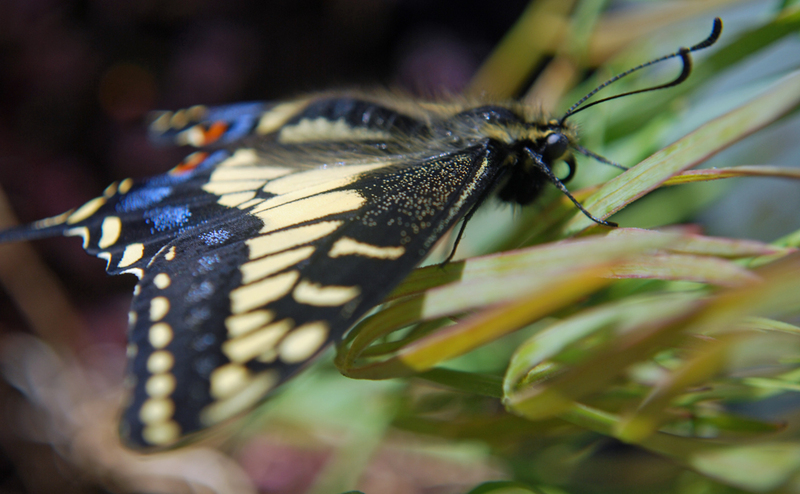 Anise swallowtails can remain in the chrysalis stage for years, and some of the ones that emerged have been gestating for more than two years. Every time we release a female I ask her to come back to our garden to lay eggs. 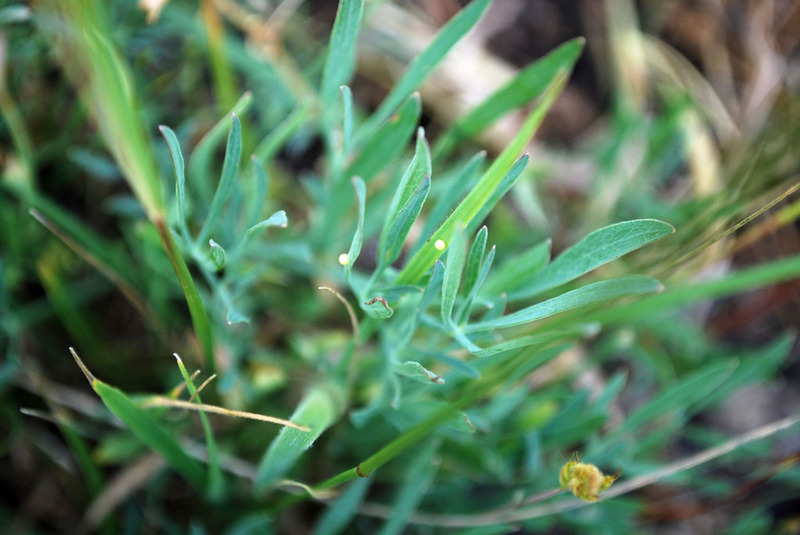 The native plant that anise swallowtails lay their eggs on is called yampah. George has some yampah in a pot, but it grows very slowly. A couple of years ago we were thrilled to find some eggs in our yampah. 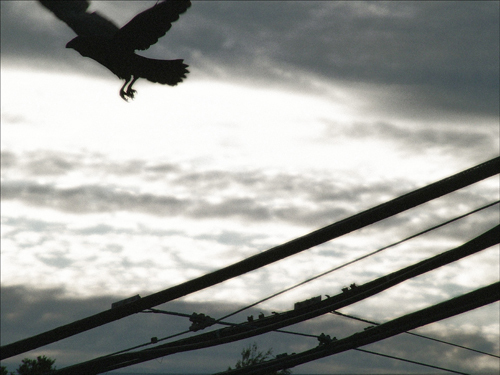 Here’s a picture I took. The egg is the tiny yellow dot near the center of the picture. It’s about the size of the head of a pin. 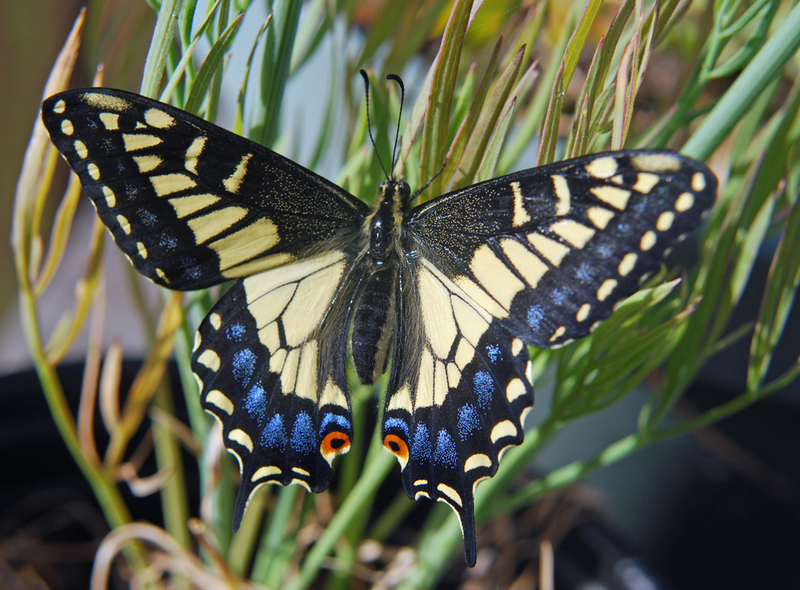 Since yampah is very hard to find in the wild around us (not much wild left hereabouts …), the anise swallowtails in our area have turned to the fennel plant to lay their eggs and as their larval food source. Fennel grows prolifically in vacant lots and along the highways. Many people cut it down as it gets rangy later in the summer, which is too bad, because they’re killing hundreds of swallowtail eggs and caterpillars. Anyway, to the point of this post .. drum roll please … I found three eggs on our fennel this morning! Here’s one. We released this female last Tuesday, maybe they are her eggs? 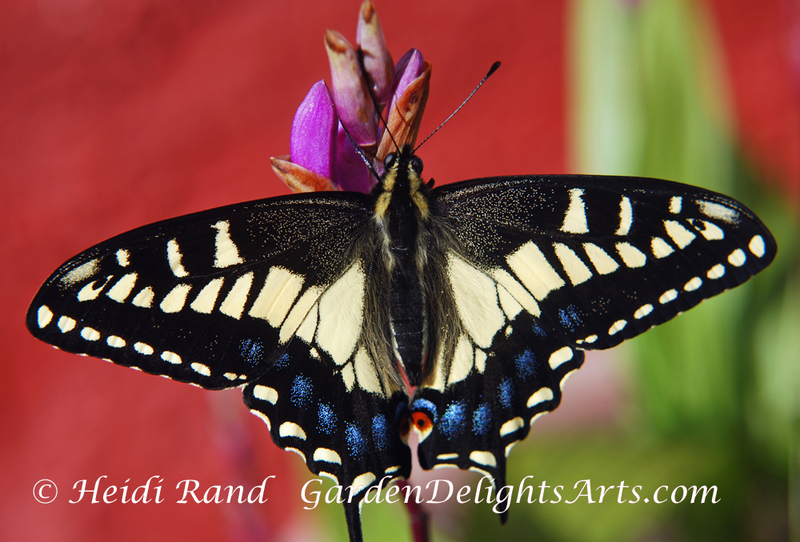 Have you seen many butterflies in your garden yet? Do you plant milkweed for monarchs or other plants to attract and feed butterflies? The East Bay Chapter of the California Native Plant Society presents the 2011 Native Plant Fair on Saturday, October 1, from 10 am to 3 pm, and on Sunday, October 2 from noon to 3 pm at the Native Here Nursery, 101 Golf Course Road, Berkeley, in Tilden Park across from the entrance to the Tilden Golf Course. 20,000+ plants, including bulbs and ferns, will be offered for sale. 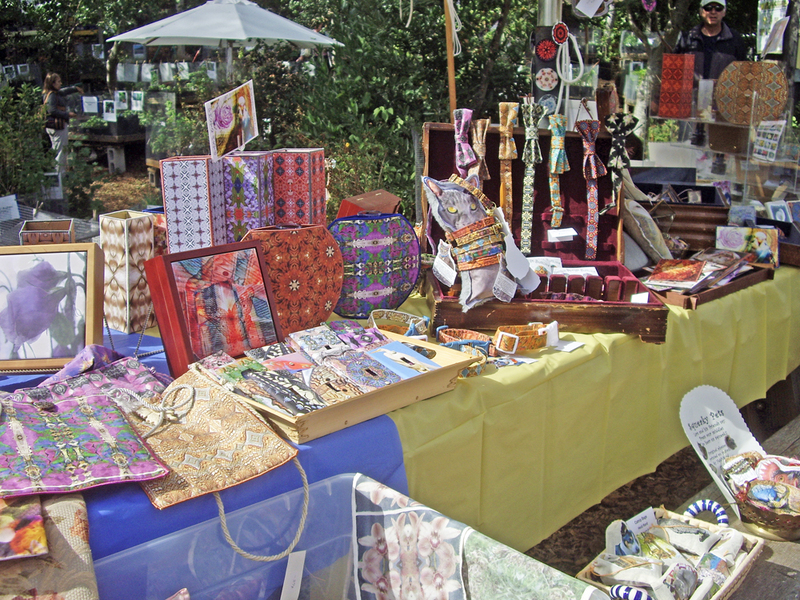 Come for a wonderful selection of local native plants, seeds and bulbs, lectures, books, posters and gifts — as well as to see local photographers and craftspeople with their native and nature-related arts and crafts. Free admission! I will be there both days — please stop by my table to say hello. 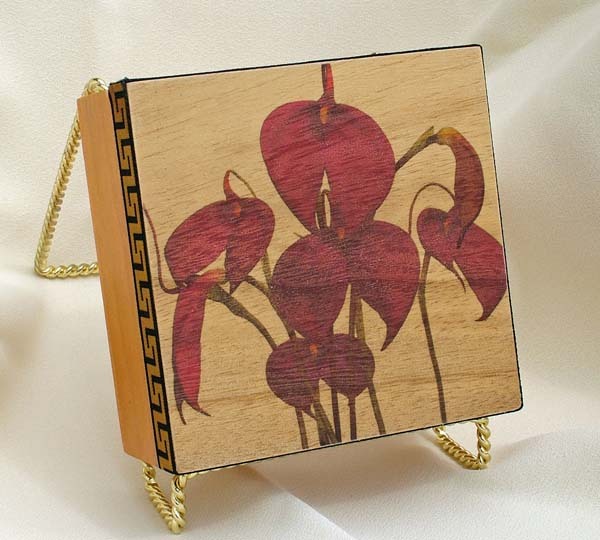 I’ll bring a great selection of my original nature-based arts and crafts works, including many prints of native plants, butterflies and insects, my fabric art, tile boxes, cards, silk scarves, and much more! This event is a major source of funding for the East Bay CNPS. Over twenty people volunteer regularly at the Native Here Nursery, open year round to benefit the chapter through sales of local native plants. 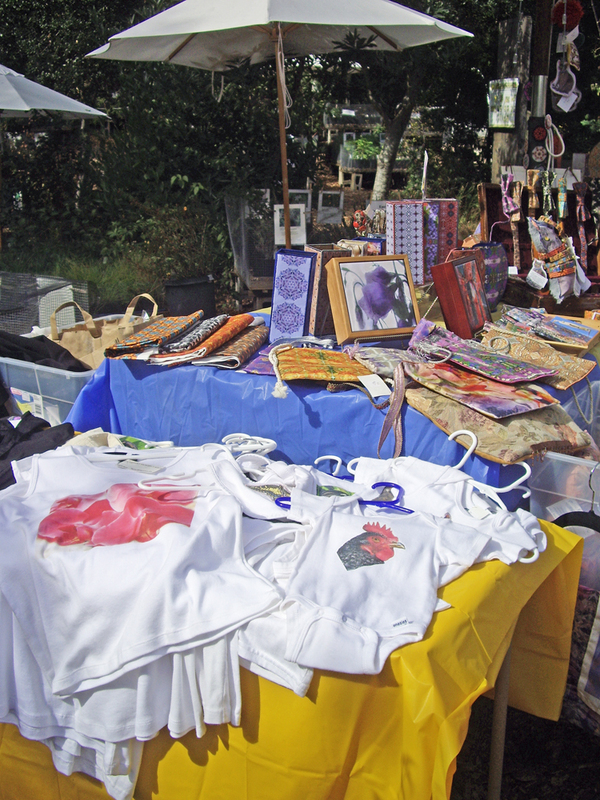 Click here for more information about the Fair, including a catalog of plants that will be for sale. Anise swallowtail butterfly from 2006! I think I’ve mentioned here before that anise swallowtail butterflies don’t emerge from their chrysalises on a set timetable, like monarch butterflies do. George thinks that it’s probably to ensure better survival, so some of the adult butterflies will emerge pretty quickly – in a couple of weeks, but others hang out for much longer. 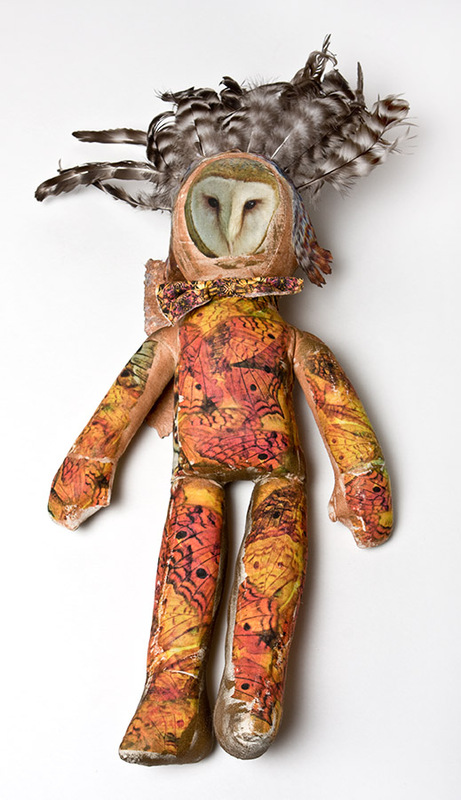 You can tell that they’re still alive by touching them gently – they move. 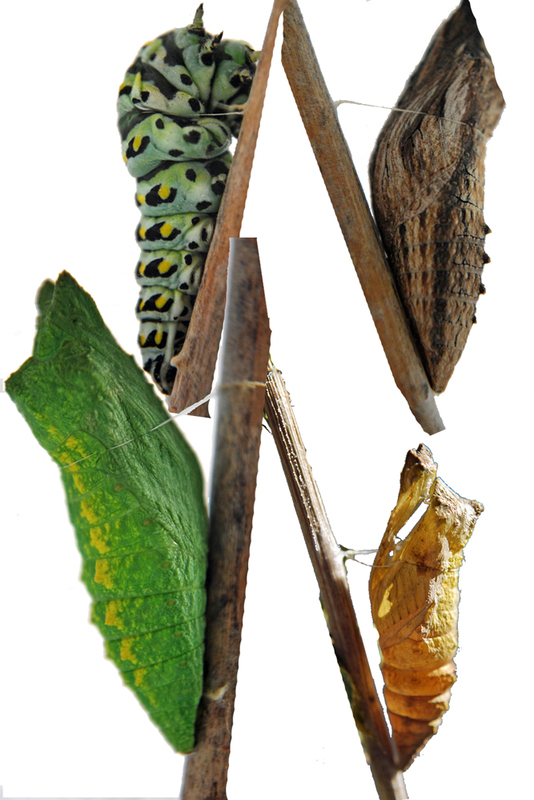 This photo collage I did for the butterfly exhibit in the El Cerrito Library shows the caterpillar getting ready to become a chrysalis (pupate) – that’s the top left. The bottom left and top right show how different the chrysalises can look, some bright green, and some drab brown. The bottom right one shows what the empty chrysalis looks like after the adult butterfly emerges. Anyway, we were so excited to see that the beautiful female that emerged today became a chrysalis way back in 2006! She must have come out sometime during the night, because she was ready to go this morning. Since the weather is so nice, we put her outside on a yampah plant, that’s the native larval food source for anise swallowtails. While she was resting happily in the sun, I got this photo of her from the side, showing her head, including her eyes, proboscis (that’s what they sip liquid food through), and antennae. We always hope that the females we raise and release will remember the plant and come back to lay eggs, so we can continue the cycle. We let him go quickly because the weather was really nice. 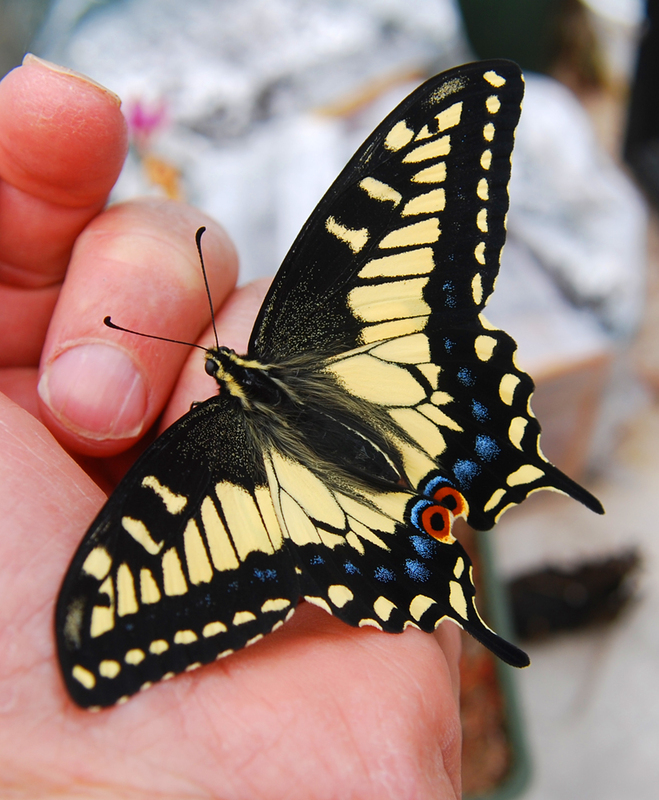 The anise swallowtails can remain in the chrysalis stage for years. We’ve had some for more than two years. You can tell they’re still alive because if you touch the chrysalis gently it will move. It’s very different with monarch butterflies — the timing for the stages monarchs go through from egg to emergence are always the same. 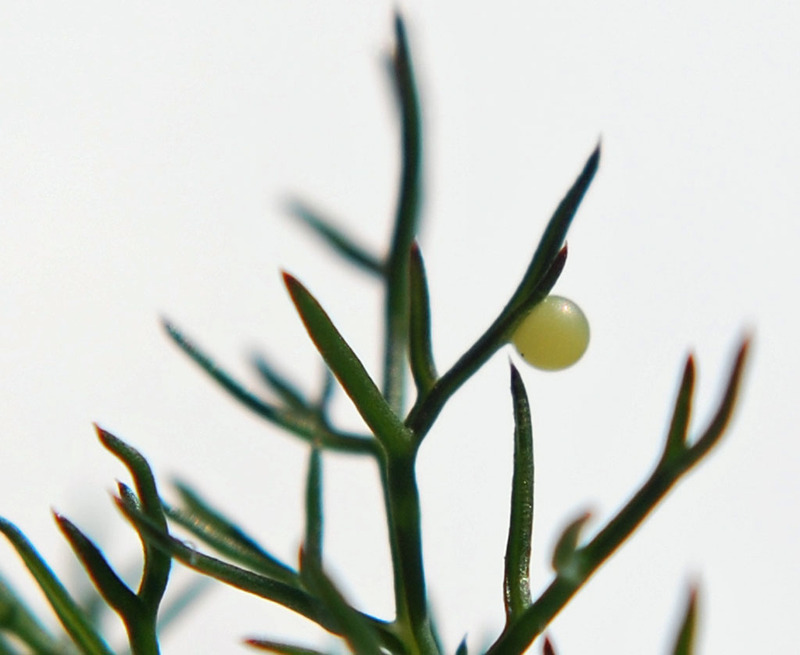 So, as for the cycle of nature turning — today I found three eggs on the fennel in our garden! The native plant the anise swallowtails lay eggs on is called yampah. This great online resource, CalFlora.org, has lots of information about yampah and other native plants. We have some yampah in a pot, but it grows very slowly. Here’s a picture I took last year. The egg is the tiny yellow dot near the center of the picture. It’s about the size of the head of a pin. This is roughly three times larger than life size. 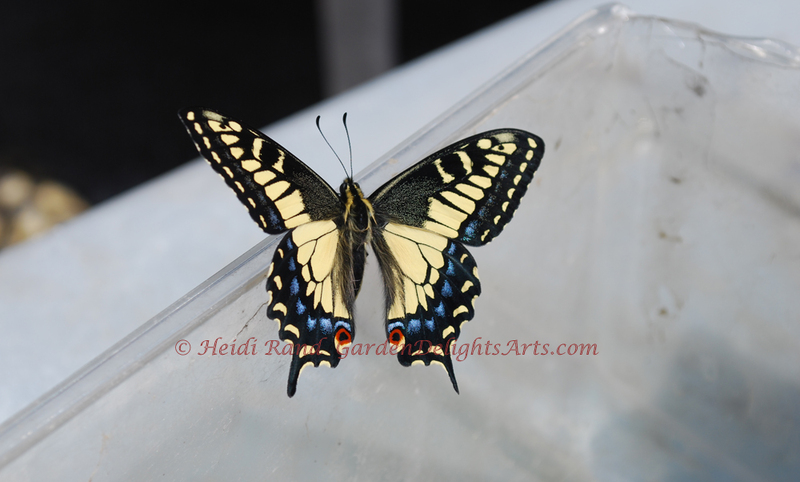 These last 2 pictures are from a series I did on the entire life cycle of the anise swallowtail butterfly. You can see all of the photographs on my smugmug gallery. What butterflies have you been seeing your garden? Do you plant milkweed for monarchs or other plants to attract and feed butterflies?